Provide comfort for the family of Jean Loubet with a meaningful gesture of sympathy. Jean Pierre Loubet was born on September 25th, 1929 in Los Angeles, CA to Louis and Florence Loubet. He was raised in San Bernardino and Los Angeles Counties, CA, spending much of his early life in that region. He attended Loyola High School in Inglewood, CA, Mt San Antonio College in Walnut, CA and San Diego State University. Jean served in both the US Navy as well as the Army. In the course of his life Jean worked in the aerospace industry, notably working for the Aerojet General Corporation in Azusa, CA for 17 years. In 1976 Jean returned to his passion, agriculture, and from 1977-2001 grew hay, grain and certified seed in Janesville, CA as well as operating a successful custom farming business. 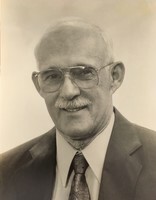 Jean served in county government for three terms as a Supervisor, running unopposed for his third and final term. Upon retiring from farming in 2001 he and Alice lived for a time in Reno, NV, in Oloron Saint Marie, France and again in Reno, NV before moving in 2005 to Cedar City, UT. In a college drama class in 1952 Jean met Alice Pertile. They fell in love and were married in 1953. They faced life together and would have celebrated 66 years of marriage this June 27th had he lived just a bit longer. Jean and Alice raised five children, and lived to tell the tale! They were wonderful parents and over the past several decades enjoyed the role of grandparents and great grandparents as well. Jean’s faith in Christ characterized his life. He and Alice set both the standard as well as the example for their family. They are members of Christ the King Catholic Church where they have participated in the church community since 2005. They served together at “Ye Olde Catholic Thrift Shoppe” and in the church choir. Jean was also a member of the Knights of Columbus. Jean is survived by his wife Alice of Cedar City, UT, son Anthony Loubet (Cindy) of Janesville, CA, Daughter Teresa Loubet of Des Moines, WA, Daughter Jeannie Diermier (Rob) of Arlington, TX, Daughter Valerie Orlemann (Andrew) of Parowan, UT, nine grandchildren and 19 great-grandchildren and numerous nieces and nephews. Jean was preceded in death by a daughter, Diana in 1980. A Mass of Christian Burial will be held at Christ the King Catholic Church in Cedar City, UT on Friday, April 26th at 11:00 AM. It will be preceded by a rosary at 10:00 am followed by a brief viewing at 10:30 am. There will be a fellowship time to follow after the service at the church. Jean will be interred in the family plot at Janesville Cemetary in Janesville, CA the following week. The family requests that any donations made in Jean’s memory be sent to either St. Jude’s Children’s Hospital or to St. Joseph’s Indian School. To send flowers in memory of Jean Pierre Loubet, please visit our Heartfelt Sympathies Store.